Need to Help the Environmental Impact? We can help! Keep the start-up kit in a safe place. Any changes in the waste stream which result in a decrease in the effectiveness of the prescribed treatment can often be troubleshot in-house or over the phone, using the products already on-hand. Prior to installation, every waste stream was sampled and lab-tested to determine the best method of treatment. This method is delineated in the Test Report, and returned to the customer with an example of how that particular sample was treated along with the resulting floc. It is assumed that these initial samples are representative of the on-going nature of the waste stream to be treated, and in most cases of steady-state industrial processes, this is in fact true. However, it is always a good idea to perform a jar-test of the current effluent before filling the RT-unit for the first time. Each start-up kit includes a standardized jar with a marked fill line, the designated reactant powder, and any other necessary chemicals to perform a bench/jar test. Fill the jar to the mark with effluent which is representative of that which will be put into the RT-unit, i.e., after any necessary pre-treatment. If it is not possible to do this, appropriate steps to emulate pre-treatment, such as settling, skimming, etc., must be taken before continuing the bench-test. After filling the jar, make chemical additions in the order and proportion specified on the individualized Start-up Test sheet, which is included with the start-up kit. Make sure to cap the jar and mix thoroughly after each addition. 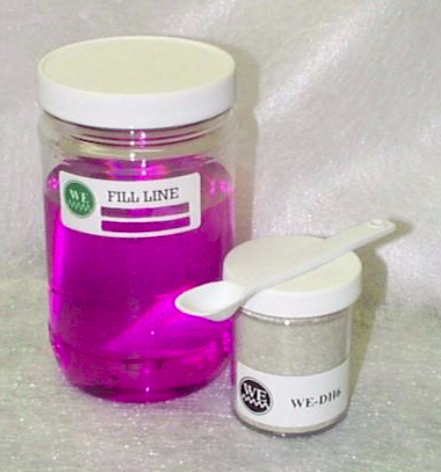 The WE reactant powders should be sprinkled lightly over the entire surface of the liquid, never ‘slugged’ in one mass. After the last addition (usually one of the WE reactant powders), cap the jar and shake well. Too vigorous mixing can result in ‘sudsy’, which may inhibit flocculation and should be avoided. If this occurs, you may either swirl the mix to break all the bubbles and proceed, or start over. “Sudsy” does not occur in the RT as all mixing takes place below the surface of the liquid, and therefore no air is entrained in the mix. Results are generally visible within 1-2 minutes of shaking, and can be viewed through the clear jar, or filtered to separate the floc and treated effluent. 5. Fill the jar to the mark with effluent which is representative of that which will be put into the RT-unit, i.e., after any necessary pre-treatment. If it is not possible to do this, appropriate steps to emulate pre-treatment, such as settling, skimming, etc., must be taken before continuing the bench-test. 6. After filling the jar, make chemical additions in the order and proportion specified on the individualized Start-up Test sheet, which is included with the start-up kit. Make sure to cap the jar and mix thoroughly after each addition. The reactant powders should be sprinkled lightly over the entire surface of the liquid, never ‘slugged’ in one mass. 8. After the last addition (usually one of the WE reactant powders), cap the jar and shake well. Too vigorous mixing can result in ‘sudsy’, which may inhibit flocculation and should be avoided. If this occurs, you may either swirl the mix to break all the bubbles and proceed, or start over. “Sudsy” does not occur in the RT as all mixing takes place below the surface of the liquid, and therefore no air is entrained in the mix. 9. Results are generally visible within 1-2 minutes of shaking, and can be viewed through the clear jar, or filtered to separate the floc and treated effluent.